On June 13, the computer models were indicating a very unstable atmosphere for areas between London and Guelph. If just one lake breeze formed and moved in-land from either Lake Huron or Erie, the trigger that was needed for severe weather would be in place on the 14th. Not one, but two lake breezes did form during the early afternoon hours on the 14th and the stage was set for severe weather to occur a short time later. As the KWARC CANWARN Manager, I waited and watched for the above parameters to come together. 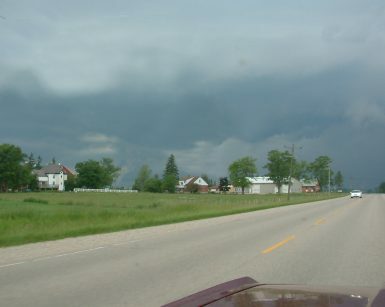 Storms that formed on the lake breezes quickly became severe and in the short time it took to drive from his home in Kitchener to the Fire Hall on Weber street, they had rotating updrafts and tornado warnings were issued for Elmira, Mount Forest, Arthur, Guelph and Kitchener when rotating wall clouds with funnel clouds were reported by CANWARN spotters. 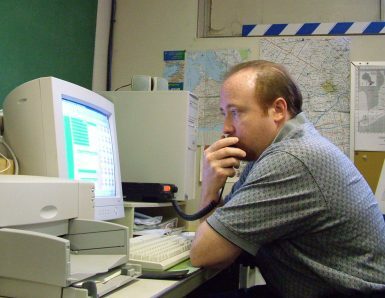 The Kitchener net was opened under code RED when a tornado warning was issued for Elmira. NEXRAD Radar and VIL scans had tornado TVS hook echo and shear couplets that confirmed what the spotters were reporting in the field. 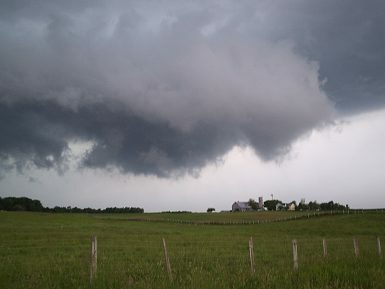 The first report of a rotating wall cloud was from west Guelph. Mark Robinson VA3MZO and Dave Patrick (Dave's wall cloud photo inset here on left) reported another rotating wall cloud north of St. Clements. Paul Cassel, VE3SY, reported what he thought was rotation heading over him in Petersburg from the south-west. This was also reported a few minutes later by Terry Green VE3NSV. Not known to Paul or Terry at the time, a shear couplet was shown on the Buffalo Radar image at the time of their report. My wife, Sandra, told me a rotating wall cloud passed directly over our home when I was at the Fire Hall running the net under code RED for our members. Even Toronto was under a tornado warning when a huge rotating storm was observed on weather radar over metro Toronto. This is highly unlikely to say the least. While most had rotation "capable" of producing tornadoes, most if not all storms had rotating wall clouds, even a few funnel clouds, but no confirmed touchdowns as of this writing. Ron would like to thank all CANWARN spotters who checked in when things weakened slightly to allow a brief drop from RED to YELLOW back to RED to log spotter check-ins. Also, thanks goes to Paul VE3SY and Terry VE3NSV who passed special weather info to net control.